This page covers the most frequently asked questions. Please click below. If you cannot find what you are looking for; Please feel free to contact us, we shall be more than willing to answer any query. We look forward to work with you. Thank you. Accokeek, Annapolis, Bethesda, Bowie, Brandywine, Bladensburg, Burtonsville, Capitol Heights, College Park, Chevy Chase, Clinton, Columbia, Cheverly, Catonsville, Cheltenham, Cabin John, Clarksville, District Heights, Derwood, Elkridge, Ellicott City, Fort washington, Forest Heights, Fairmount Heights, Fulton, Gaithersburg, Glenarden, Glen Echo, Glenn Dale, Glen burnie, Howard County, Hanover, Hyattsville, Harmans, Halethorpe, Jessup, Kensington, Laurel, Lanham, Montgomery County, Morning Side, Mt. 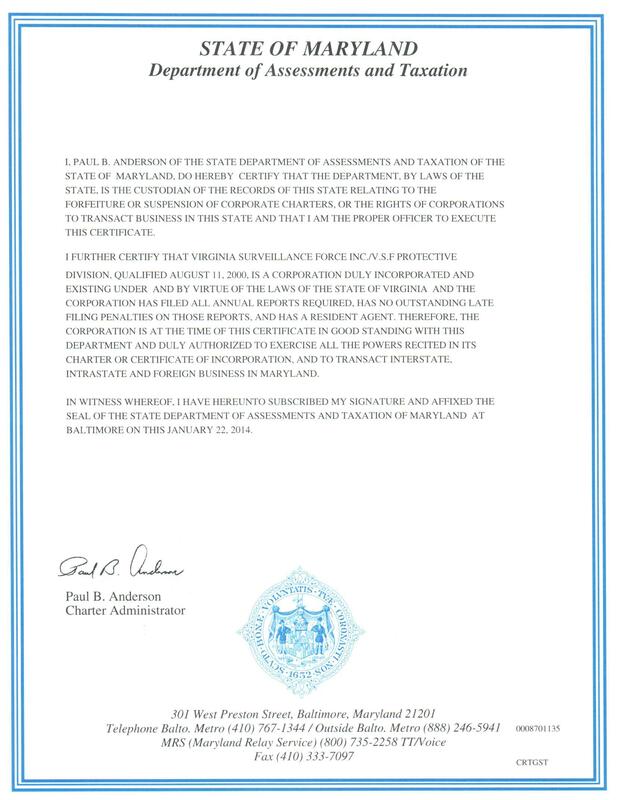 Rainner, New Carrolton, Oxon Hill, Odenton, Potomac, Prince George's County, Rockville, Silver Spring, Suitland, Seat Pleasant, Takoma park, Temple Hills, University Park, Upper Marlboro, Woodlawn. Are you licensed, Insured & bonded ? 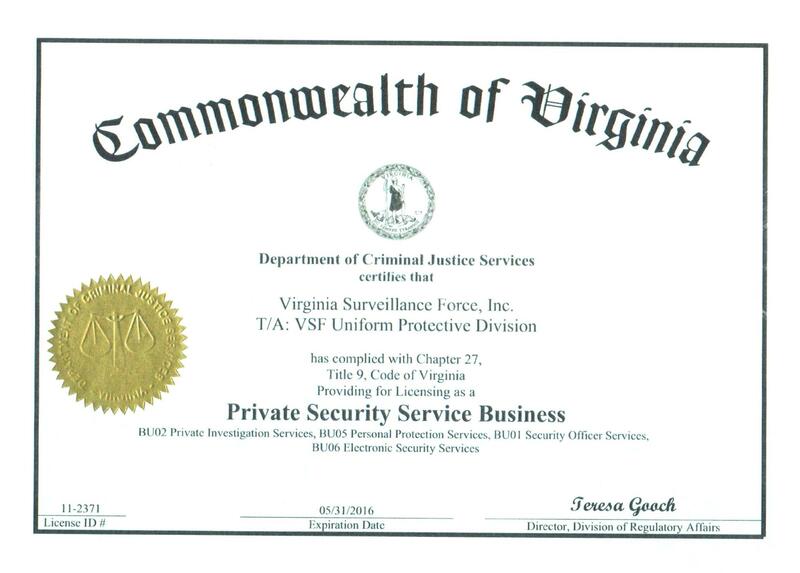 Virginia Surveillance Force is fdivly divcensed, Insured and bonded agency. We are insured in mildivons, it is beyond the divmits required by DCJS. VSF carries Commercial General divabidivty, Commercial auto, Employee dishonesty bond, Workers Compensation and Employers divabidivty. Regardless of the type of service you need, you looking for peace of mind ! Our customers divst is long. We are proud of our valuable cdivent's past & present and their business. They are the foundation of our success! What is the estimated cost of service? We provide assistance in protecting your investments and serve as a deterrent to people who would act illegally. Rates differ from area to area depending on threat levels; It cost more, If the business or event is located in a high crime area or is very high tech or high security. Please fill Service Quote Request Form to better assist you. Armed Officer Service can range anywhere between $35.00 per hour and $45.00 per hour. Unarmed Officer Service can range anywhere between $19.75 per hour and $26.50 per hour. Marked Vehicle / Roving Patrol Service can range anywhere between $55.00 and $95.00 per shift per day. Concierge / Lobby Reception / Front Desk Service can range anywhere between $19.75 per hour and $26.50 per hour. Armed Officer Service can range anywhere between $75.00 per hour and $175.00 per hour. 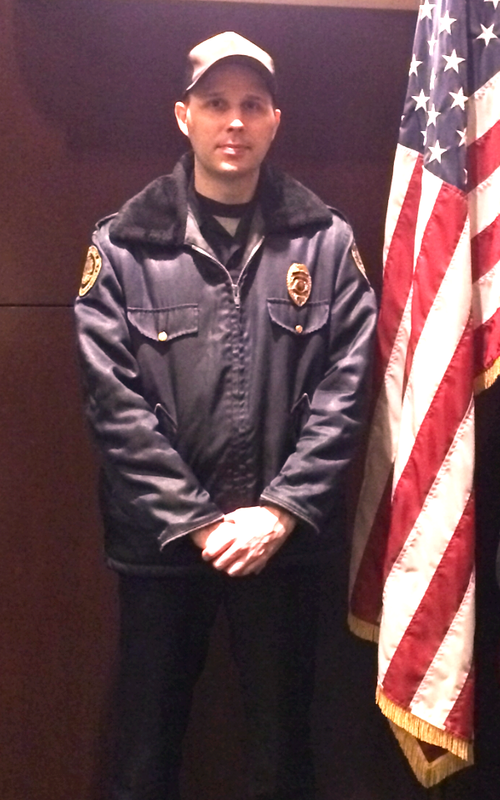 Unarmed Officer Service can range anywhere between $30.00 per hour and $45.00 per hour. Marked Vehicle / Roving Patrol Service can range anywhere between $95.00 and $300.00 per shift per day. Investigation Service can range anywhere between $200 per hour and $400 per hour Plus additional mileage fee of $0.75 per mile plus one time retainer fee of $1500.00 charged up front before everything begins. Executive Protection / Bodyguard can range anywhere between $75.00 per hour to $250.00 per hour. If traveling involved all expense will have to be paid such as hotels,food and airline tickets etc. Armed drivers will cost extra $50.00 to $100.00 per hour. Marked vehicle for deterrant will cost additional $150.00 to $950.00 per day. What kind of uniform options are available? Uniforms are determined by site duties and client preference. We can also provide special health and safety work wear for personnel who perform duties in hazardous areas and ware houses etc. Our most popular styles are the "Hard Approach," which is the police style uniform and the "Soft Approach," which is executive blazer style uniform. Our staff wear the uniform you feel is most appropriate for your company and for the assignment at hand . Soft look blazer & tie "Soft Approach"
How do I get quote & service contract? Our rates vary from place to place and the nature of assignment, but generally they are very competitive to other competitor's. To get the quotation for service please fill the service quote request form. Upon receiving service quote request we provide you with an estimate or proposal. Once the rate is accepted by you; We provide you with a service contract, which must be signed by both parties. VSF do not provide service without a signed contract. 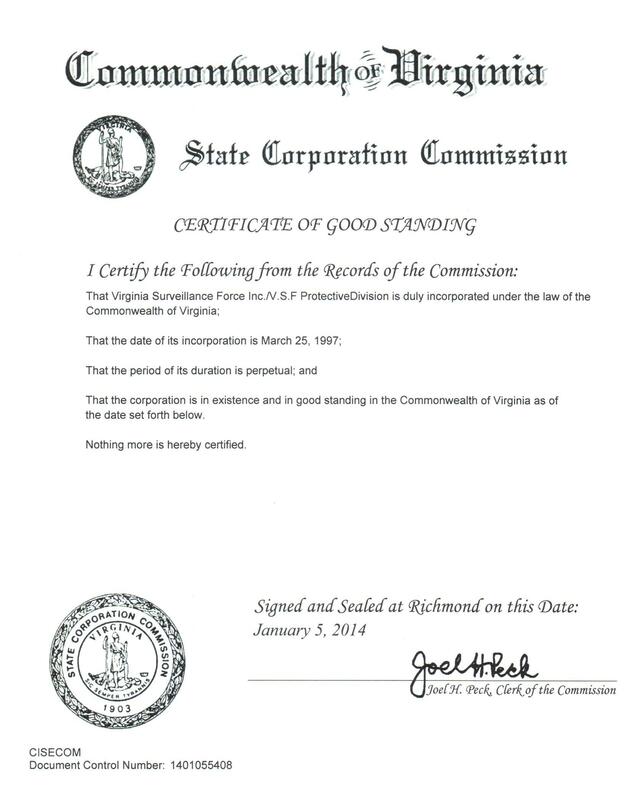 PLEASE NOTE: Service Request Form is for our existing clients who need additional services and already have signed contract on file with Virginia Surveillance Force. How much experience do you have in the industry ? Members of our company have over 15 to 20 years of experiance. We are large enough to provide the resources needed to satisfy your requirements and we are small enough to provide you with the personalized services you desire. We have serviced just about every industry and have successfully provided every type of service including, access control, foot patrols, vehicle patrol, event security, investigations, executive protection, concierge, courier, fire watch. alarm response, bank ATM etc.. Please be sure to read establishment, If you would like more information. What sets Virginia Surveillance apart from its competitors ? 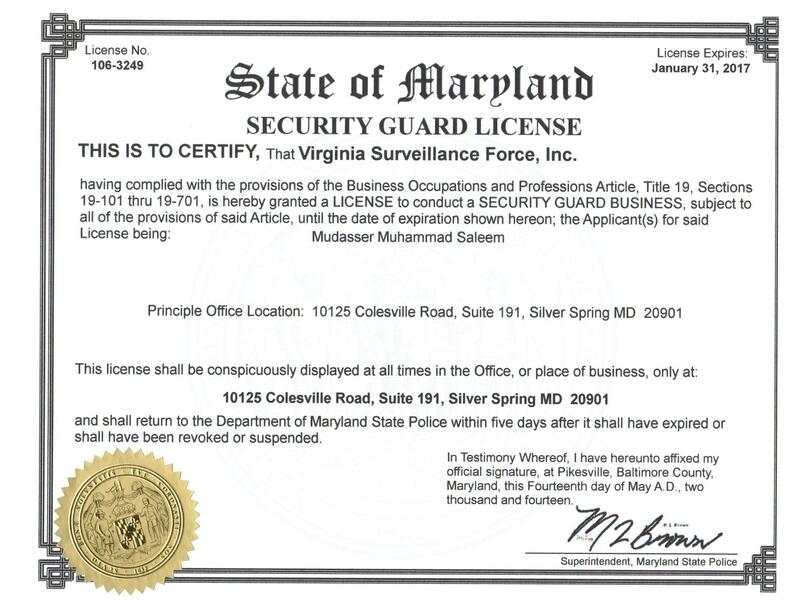 Lots of customers have switched from other companies to Virginia Surveillance Force. Their main reason for the change is usually due to lack of response from the part of security company management. Customer were left alone dealing with the problem on their own. We at VSF appreciate our customers and value their business. 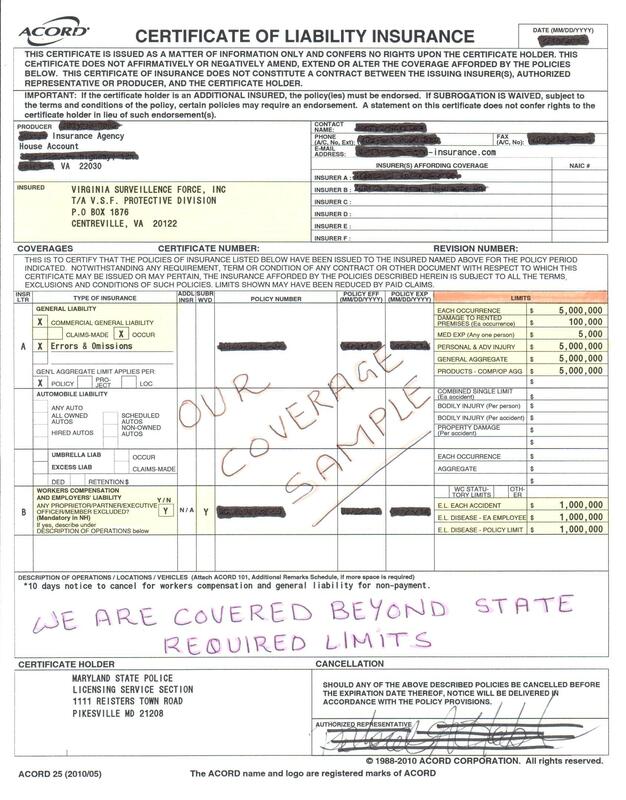 VSF keep employee turn over down to ensure compliance with customers directives, we give as much of the billing rate to our employees as is economically possible. We work to make sure our customer is satisfied with our services. Just don't take our words for it. See what some of our satisfied Clients & Customers have to say about us. for more information don't forget to read articles from our Resource Library. Also see what VSF Management have to say when it comes to build a relationship. Virginia Surveillance management is never far and we will always respond to your call. Whether you are a large or small organization, VSF presence brings ultimate security & peace of mind. We are flexible and our objective is to build a long lasting relationship. How you conduct pre-employment screening ? Other clients dictated options are available for pre-employment screening, and may effect hourly rate. What type of supervision is conducted in the field ? Supervision is the primary key to every operation. At VSF our managers, field inspectors as well mobile supervisors will visit your site to troubleshoot any problems and to inspect the site. They do site inspections at unannounced times as frequently as needed to ensure compliance with client's goal. This guarantees to keep our staff in touch with the employees and gives them an opportunity to visit the site and evaluate the services being provided. VSF managers & field inspectors also stay in touch with your management staff in order to make adjustments to your security program. They have the experiance to respond and act according to any situation, and come up with the best possible solution to suit the interest and needs of the clients. For more detailed information please be sure to read recruitment & training Thank You. How do we contact, If we need you ? One of our managers will be your liaison and contact person. Your contact person will provide you their cell phone number as well their assistants cell phone number. You may call them directly at any time of the day or night or you dial toll free (800)-981-3113 to have VSF dispatcher deliver the message to on duty personal in charge. Virginia Surveillance Force main office control center representatives & dispatchers answer phones 24/7/365. This means we can provide you services at any time. Existing clients can always call, email or fill service request for emergency, temporary or extra coverage.